You will probably agree there’s no such thing as an occupational therapist uniform. That’s because the role is one of the most varied within the healthcare profession. But whether you work in the community, in industry or in a hospital, you’ll want to look professional but at the same time be comfortable. At Alsicare, we design, manufacture and sell a wide range of healthcare garments. Whether you prefer to wear tunics or polo shirts, our ranges have a good selection of garments suitable for mixing and matching. Let’s start with a healthcare staple: Our trousers. Whether you’re male or female, we have a great selection of trousers occupational therapists can combine with either our shirts and tunics or your own. For women we offer three different styles of trouser in two different leg lengths: bootleg, straight leg and elasticated. We think there is a style for everyone and sizes go up to 26 or XXLarge, depending on the style. As far as colours go, you can opt for black, navy or smokeberry. For men we offer two different styles in navy or black. Choose from sewn down creases or pleats. Again, two leg lengths are available and sizes go up to a 42. Our trousers are priced from £7.79 to £11.95, so no matter what style you choose they won’t break the bank! And did we mention how comfy they are? The question is then what to team with your trousers. If a more casual look is supported by your working environment we can recommend our Physiotherapy Polo Shirts which are available in Male and Female styles. This is a very clever design because it’s double faced, having cotton on the inside for comfort and polyester on the outside to prolong wear and colour. The female shirt is a flattering A-line cut, while the male version is straight. Both are industrially launderable. Priced at £13.95, sizes for both styles range from XS to XXL . Beyond that we have a wide selection of tunics suitable for teaming with trousers. All allow a good level of movement and are made from easy care fabrics. Our standard female Tunic is priced from £14.49 and money saving multi packs are available. Our standard Male Tunic is priced at £13.95 and again saver packs are available. Special offers are sometimes available in our sale. 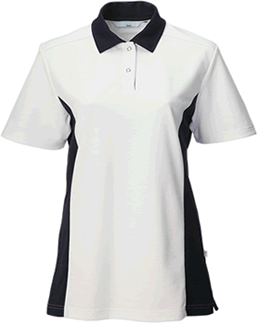 The physiotherapy polo shirt and our tunics can all be embroidered with your choice of logo or name. Prices for embroidery start at £1.30 per line. Order made before 3pm qualify for free next day delivery on most orders.